El Ibérico is a fortnightly Spanish newspaper edited in the British capital. It featured Amanda Lundstedt, singer, activist and My Belly is Mine campaigner on the front page of today’s edition. Amanda Lundstedt, My Belly is Mine campaigner, on the front page of ‘El Ibérico’. The picture was taken during our recent London underground protests against Gallardón’s antiabortion law, organised in conjunction with the Spanish Women’s Assembly. These protests feature in an article in El Ibérico that discusses the new abortion support network Red Federica Montseny set up in London by the Women’s Assembly. You can read more about the RFM network here. 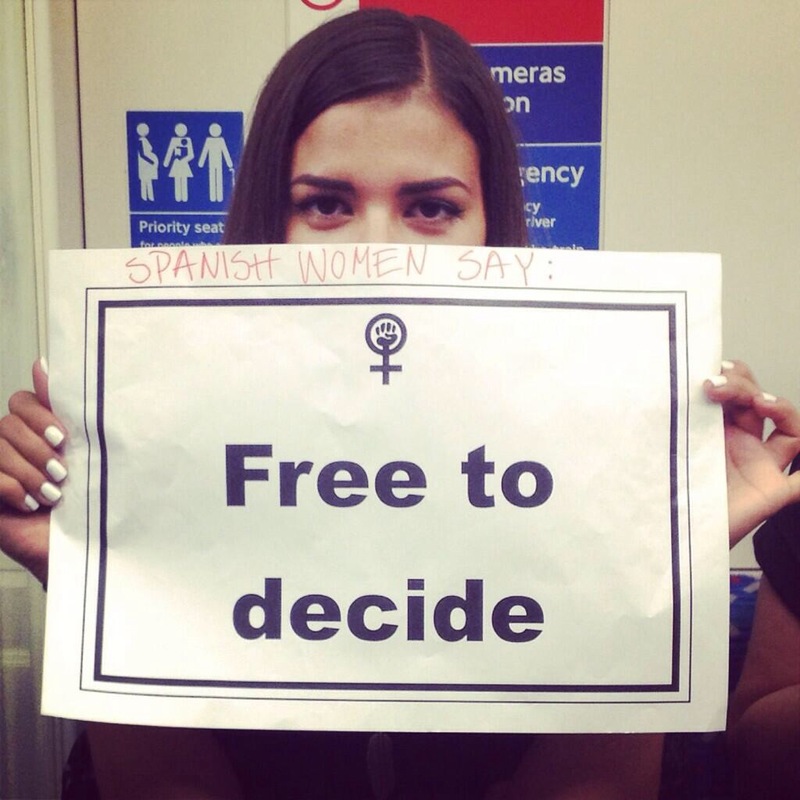 Spanish feminists are already setting up a support network in London for women affected by the notorious antiabortion law likely to be passed in Spain in August. 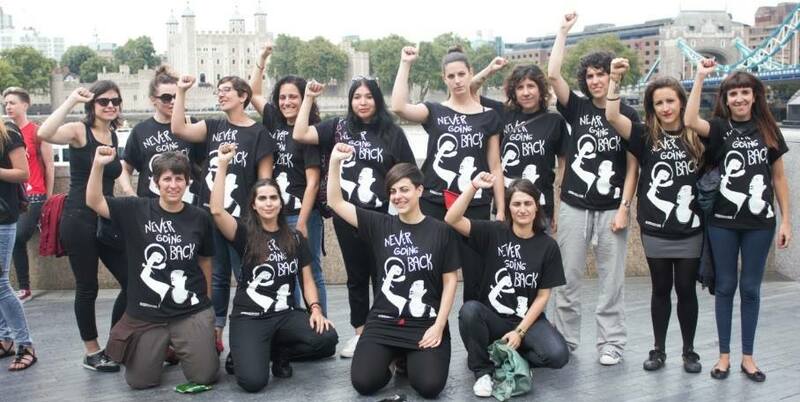 The Spanish Women’s Assembly is a women only subgroup of the 15M Movement in London. They launched a mission statement this morning which details the ethics and goals of this support network, made up of women from the Assembly and volunteers. This support group is still in the early stages of planning but aims to provide direct assistance to women travelling to the UK for abortion. The network is to be known as Red Federica Montseny in honour of the Spanish intellectual, anarchist and prochoice legislator Federica Montseny (1905-94), one of the first women in Europe to hold a position as a Cabinet Minister. The idea originally sprang from Feminismos, the Berlin based Women’s Assembly, which is also part of the 15M Movement. The network is composed of different ‘nodos’ (branches) such as Brussels, Lisbon, Paris, Vienna, Bordeaux and Stuttgart. The British capital, however, will probably be the main destination for Spanish women seeking terminations when the antiabortion legislation is in effect. With this in mind, the London branch of the RFM is also to be known as SWASG 2.0 as a tribute to the support work carried out by Spanish women in this city in the 1980s when abortion was illegal in Spain. 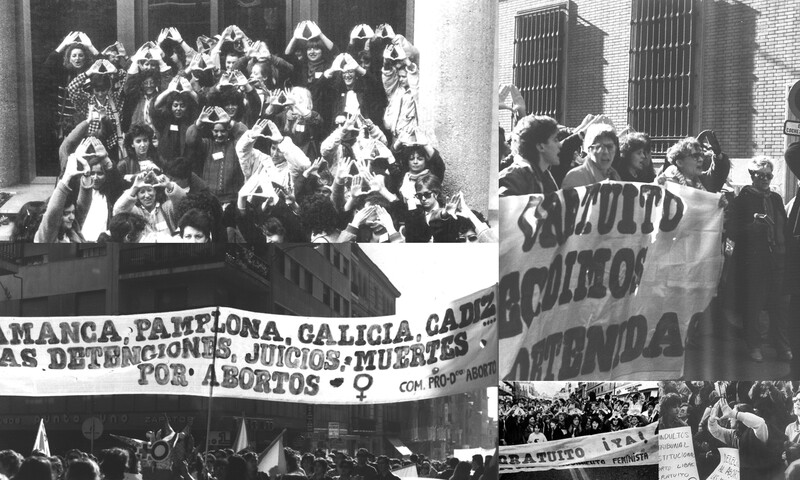 Protests in Spain in the 1980s against the criminalisation of abortion. 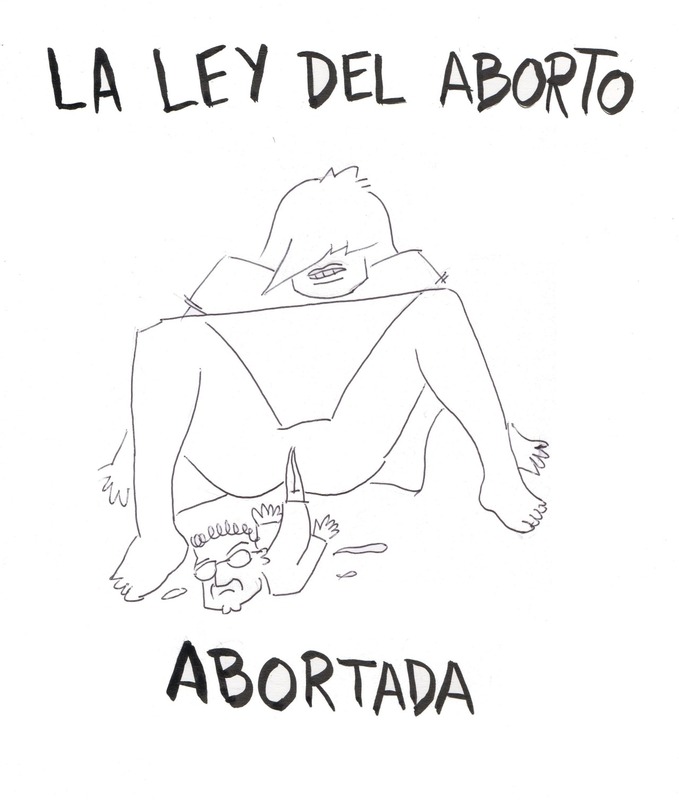 The network is therefore also understood as a political statement that draws attention to the regressive nature of Gallardón’s antiabortion law and calls for women to be in full control of their bodies and reproductive choices. Friends of My Belly is Mine: Speaking of I.M.E.L.D.A. My Belly is Mine have collaborated on a number of actions with direct-action feminist performance group Speaking of I.M.E.L.D.A., including one in which we targeted the English Secretary of State for Health, Jeremy Hunt. The “Imeldas” are supporting My Belly is Mine‘s joint campaign with the Spanish Women’s Assembly against the Spanish abortion reform. Speaking of I.M.E.L.D.A seeks to challenge the ongoing problem of Ireland Making England the Legal Destination for Abortion. We operate against the shaming and silencing of women living in the north and south of Ireland who have had abortions in England. The name Imelda was used as a code-name by the approximately 6,000 women who travelled to England for abortions between 1986 and 1995. The code-name was necessary since the Information Cases in the Republic of Ireland in 1986 made it a criminal offence to travel abroad for an abortion and to provide information and referrals for abortion services. Since 1995, an average of 12 women a day have continued to travel from Ireland, north and south, to England for abortions. Apart from the considerable expense and stress of having to travel abroad for a medical procedure, these women are often denied follow-up after-care. In addition, in 2013, the Republic of Ireland implemented a 14-year prison sentence for women who have abortions in Ireland illegally. This has dire consequences for women who take pro-abortive medication because they cannot afford to travel or are not permitted to leave the country. We want women in the north and south of Ireland, and women across the world, to have control over their own bodies and access to safe and legal medical services to support their choices. In speaking the name I.M.E.L.D.A. we wish to act in solidarity with those who seek to counteract the inhumanity of state legislation, which denies women the right to choose what happens to their own bodies and in their own lives. Speaking of I.M.E.L.D.A is based in London. We do not represent anyone but ourselves. We exist in solidarity with pro-choice groups in Ireland and throughout the world who fight draconian patriarchal regimes. On March 8th, International Women’s Day, we interrupted a conference at the Camden Irish Centre. This conference was titled Dissonant Voices: Faith and the Irish Diaspora. It was led by a group of Catholic clerics who see themselves as ‘radical,’ as well as ‘politically and socially engaged.’ In interrupting the conference, we aimed to highlight how ‘radical social engagement’ should include the right of women to choose what happens to their own bodies and in their own lives. The differing reactions of conference attendees demonstrate how our action did motivate them to engage with the reality of I.M.E.L.D.A. and of reproductive justice for women. There’s also a radio interview on this (coverage starts at 6.55). Jeremy Hunt can make it easier for women from Northern Ireland to access safe and legal abortions in England. On May 26th, we visited the English Secretary of State for Health, Mr. Jeremy Hunt, in a Sainsbury’s supermarket in Surrey in order to speak of a recent High Court Ruling which unfairly discriminated against all women from Northern Ireland. The ruling maintained that these women are not entitled to obtain abortions for free under the NHS in England, despite the fact that these women are residents and/or citizens of the United Kingdom. We emphasized to Mr Hunt that it is extremely clear from the High Court ruling that it is within his power as Secretary of State for Health to make it easier for women from Northern Ireland to access safe and legal abortions in England. In doing so, Mr Hunt and the English government would show support for full reproductive justice for women in Northern Ireland. And we ate some red apples in front of Jeremy Hunt to symbolically affirm the right of women all over the world to bodily integrity and to determine their own life-path..